It was an evening of celebration! The Arlington ISD Education Foundation brought community members together to honor 22 educational grant recipients from Arlington schools. These teachers worked tirelessly submitting grant proposals for much needed funds and programs for their students—and this was their night to shine in recognition! Held in the Bluebonnet Ballroom of the UTA University Center, over 240 people came to dine and congratulate these amazing educators. Karen Borta, from CBS 11 News, introduced each teacher and gave a brief description of the project their grant will be funding. She happily announced that the Education Foundation broke another record by providing over $106,000 in grant donations! This evening was also a special opportunity to honor one of our founding members and longtime Board member, Ann Morris. After graduating from UT-Austin, Ann became a teacher and taught for several years in Arlington ISD. For many years, Ann served as a passionate advocate for public education in our community. She was involved in every facet of education in Arlington – an AISD parent, educator, Board of Trustee, volunteer, PTA representative and a founding member of the Arlington ISD Education Foundation. The Foundation was honored to award Dr. Diane Patrick with the Dan Dipert Legacy Award. Dr. Patrick has been a dedicated public servant in the Arlington community for over 40 years, including 25 years of elected public service. She currently serves as an elected Tarrant County College Trustee and is a past Texas State Representative. Diane Patrick is known for being a champion of education. In 2015, the AISD Board of Trustees named a new elementary school after her, “Diane Patrick Elementary School.” We are honored to have Dr. Patrick on our Board and as a friend. Six Flags Over Texas received the Community Partner Award at the event. Six Flags has been a long-time partner with the Foundation and AISD as a whole. Six Flags generously helps us put on our Education Celebration event which helps us raise money for our teacher grants! 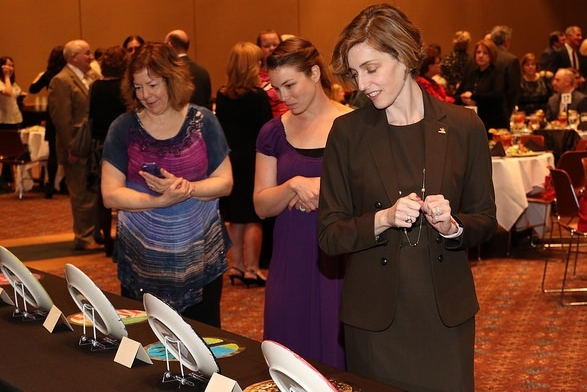 During the dinner guests were also able to participate in an online auction. Fifth grade students from AISD elementary schools created ceramic plate out of original artwork for auction. Not one plate left without a bid! The money raised from the auction and the sale of the student-made centerpieces will go directly back into the schools through programs the AEF funds. This annual event is sure to keep growing as our foundation works hard to fund as many grants as possible for our schools. Look for the next opportunity to grab a ticket later this year! To view all photos from this event - click here! Newer Post2018 Education Celebration was a HIT!